When are trade secrets discoverable? When can a competitor use litigation to find out your company’s trade secret information? What if it was your businesses’ valuable information? Pause for a moment and imagine that your business is the industry leading innovator in its field because, through your effort and resources, you have developed secret tricks and techniques for how to do things that your customers love and that is what makes your business so successful. You keep these tricks and techniques so secret that only the most trusted people inside your company — those who have a need to know them — have access to and know these secrets. These secrets are what the law calls trade secrets. They are what most real people (i.e., non-lawyers) call the “crown jewels”, “keys to the kingdom”, or the “secret sauce” — they are that important. Now, imagine that your fiercest competitor, who is called FierceCo, knows you have secret ways for how you do things, but does not know what those secrets are. FierceCo has tried for years to find out what they are but has never succeeded. Now FierceCo has met an enterprising lawyer and has a new plan. Would you want your competitor to get your valuable trade secret information simply by suing you? 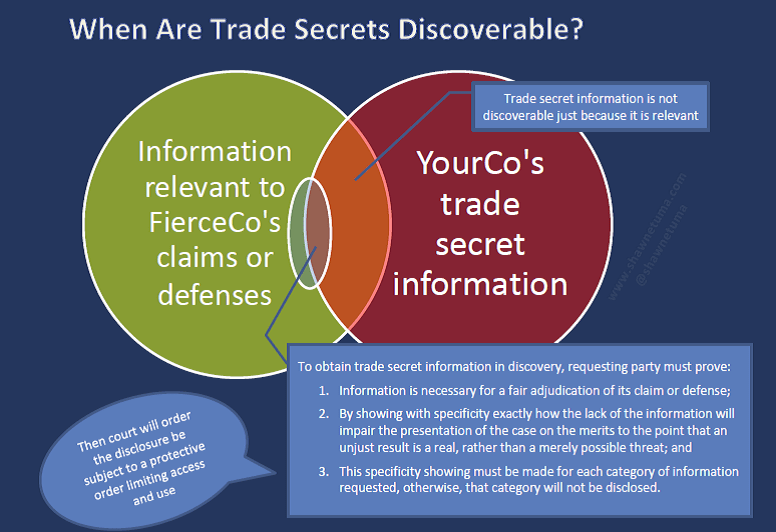 FierceCo sues your business — for whatever made-up reason it can concoct — and demands that you disclose what your trade secrets are in the discovery in the lawsuit. Will it work? After all of these years of protecting your businesses’ trade secrets from FierceCo, will you now be required to turn over the “keys to the kingdom”? Your secret information that qualifies as trade secrets is privileged and, because of that privilege, the only way FierceCo can get it is if it can satisfy a specific test under the law. And then, even if FierceCo can get access to that information, the purposes for which it can use the information are severely restricted by court order and any violation of that order could land FierceCo in contempt of court. Contempt is not good — trust me on this. The party requesting the information then establishs that the information is necessary for a fair adjudication of its claim or defense. In our hypothetical case, this means that FierceCo must meet the burden of establishing that the information is necessary for a fair adjudication of its claim or defense or else the court cannot require it to be disclosed. This does not mean simply that it is relevant to the case. Instead, FierceCo “‘must demonstrate with specificity exactly how the lack of the information will impair the presentation of the case on the merits to the point that an unjust result is a real, rather than a merely possible, threat. '” Id. at 696. “This specificity showing must be made with regard to each category of information that” FierceCo requests and for which you assert the trade secret privilege. Id. “A trial court abuses its discretion if it orders disclosure of trade secrets when the requesting party has not carried its burden to show the information is necessary for a fair adjudication of its claim.” Goodyear, 392 S.W.3d at 693. While the 3 step test of Goodyear was under the common law of trade secrets, before Texas enacted the Texas Uniform Trade Secrets Act (TUTSA) (eff. 9/1/13), the test remains substantially the same under TUTSA. TUTSA specifically instructs the Texas courts to look to the cases from other jurisdictions that have adopted their version of the Uniform Trade Secrets Act, Tex. Civ. Prac. & Rem. Code § 134A.008, and the predominate test in those jurisdictions is substantially the same 3 step test. The party opposing discovery must show that the information sought is a trade secret and that disclosure would be harmful. If trade secret status is established, the burden shifts to the party seeking discovery to show that the information is relevant and necessary to bring the matter to trial. If both parties satisfy their burden, the court must weigh the potential harm of disclosure against the need for the information in reaching a decision. Meanwhile, it is clear from the case law that establishing necessity is the heart of this three-part analysis. When necessity is established, courts frequently hold that the trade secret must be disclosed, albeit with some protection. “Necessity” means that without discovery of the particular trade secret, the discovering party would be unable to present its case “to the point that an unjust result is a real, rather than a merely possible, threat.” In re Bridgestone/Firestone, Inc., 106 S.W.3d 730, 733 (Tex.2003). Implicit in this is the notion that suitable substitutes must be completely lacking. The requesting party must meet a very high burden to establish a true necessity, as required, in order to obtain the trade secret information. This requires their showing of a true necessity with no suitable substitutes available to provide the requested information. Previous Post Why is PNC Bank Accusing Morgan Stanley of Corporate Espionage and Trade Secret Theft?